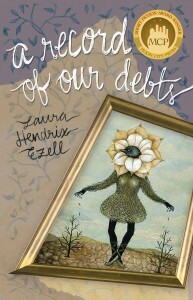 Presenting the awesome cover for Laura Hendrix Ezell’s A Record of Our Debts, winner of our 2015 Moon City Short Fiction Award! Due April 1, 2016! The art is supplied by the super-talented Kathleen Lolley and the design by Moon City Press artist, the incomparable Charli Barnes.